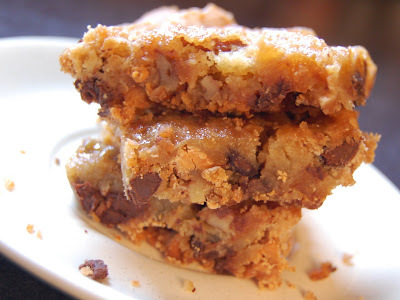 Wow, these blondies were really good. Rich, sweet, decadent, and 100% addictive. Even Joe, who isn't usually a big butterscotch fan, absolutely loved these. (Andrew loved them too, but I think that goes without saying, right?) They're the first blondies I've ever made, and an awesome beginning to what I think is going to be a long, beautiful relationship. The only issue I had was that the caramel topping made them really sticky and hard to eat with our fingers. The caramel is supposed to be marbled into the blondie batter -- but the batter's pretty thick and doesn't really lend itself well to marbling. I smeared it in the best I could, but I think most of the caramel ended up on top of the batter. So after eating these, we had sticky fingers but very happy tastebuds. It was definitely a fair trade. 1. In a large bowl, cream butter and sugars until light and fluffy. Add eggs, one at a time, and vanilla. 2. In a separate bowl, combine flour, baking powder and salt; add to wet mixture in batches, mixing well after each addition. 3. Stir in chocolate chips, butterscotch chips, and pecans. Pour batter into a greased 13 x 9-inch baking dish. 4. Dollop caramel topping on top of batter; use a knife to marble topping into batter. 5. Bake at 350 degrees for 25 minutes, or until a knife inserted in the center comes out clean. All I can say is those look really, really good!!! Hubby would love these, butterscotch chips are a fav of his.